Meet the ever-changing demands of designing structured cabling systems with training in voice/data, telecommunications, bonding and grounding, network infrastructure, project management, codes and standards, and more. 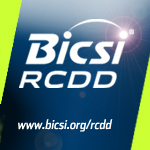 Only BICSI, the professional global ICT association, offers the elite Registered Communications Distribution Designer (RCDD®) credential. The Uniden Office Express™ 1600 (UOE) is the only hybrid telephone system that supports both traditional phone lines and VoIP lines, comes with firewall security and a built-in Wi-Fi router. Perfect for offices with 2-50 employees, the UOE offers quick and easy setup right out of the box with plug-and-play phone configuration. Designed and engineered with the latest VoIP technology, the UOE is a complete, cost-efficient telephone system for small businesses, with an average savings of 60 percent compared to traditional business phone systems. Saninco Technologies announces the availability of ap keeper, an intelligent, cloud-based accounts payable automation service for the telecommunications industry and other industries too. ap keeper removes the manual tasks involved in the AP process and uses powerful automation features to help improve AP procedures and increase productivity. In addition to automating the standard AP processes, ap keeper handles the specific needs of the telecom industry, including circuit leasing and all cost components and line items.